Psoriasis is a chronic, painful, disfiguring and disabling non-communicable disease (NCD). It affects more than 125 million individuals across the globe, causing widespread suffering and putting an enormous psychosocial burden on those affected. There are a number of treatments available, but their full potential remains unrealized within healthcare systems. 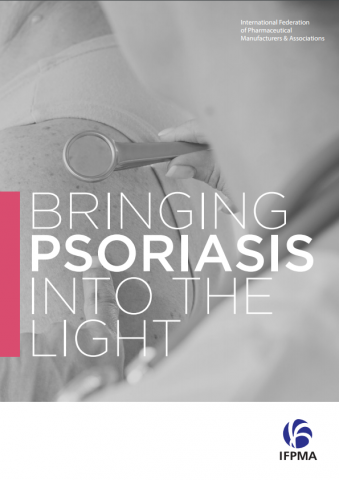 As a consequence, many people with psoriasis do not have access to appropriate therapies. Our industry is committed to continue researching new therapies to fight psoriasis as well as to work with partners to increase awareness and access to care through concerted action. 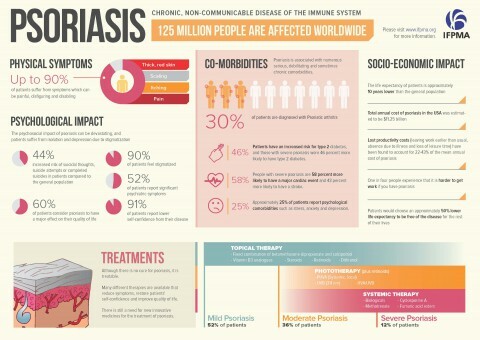 A hundred million people with psoriasis across the world remain undertreated, at increased risk for cardiovascular events and suffering social and work-related stigma and discrimination. This unmet need persists despite the widespread availability of a spectrum of treatment options. The result is prolonged, avoidable suffering; high rates of psoriasis-associated illnesses; and substantial costs to individuals and society in terms of lost productivity, cost of healthcare services and medications. The suffering from psoriasis is often underrated: the disease is much more than its immediate, visible symptoms. Psoriasis can have a devastating impact on psychological well-being and social functioning, similar to that of cancer, arthritis, hypertension, heart disease, diabetes or depression. A person’s lived negative experiences may be much more powerful that the clinical severity of symptoms would suggest. There are a number of treatments available, but many patients do not have access to appropriate therapies. Patients’ stories often recount an arduous, long and burdensome trial-and-error process trying out a number of medications. 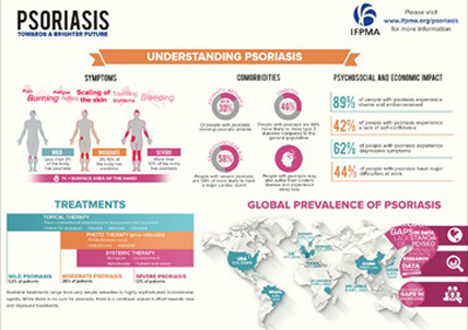 In order to remove the barrier psoriasis poses to well-being and socioeconomic development it is urgently necessary to raise the priority of psoriasis on global, regional and national agendas. Integrating psoriasis into global frameworks would help populations reach the highest attainable standards of health and productivity at every age. Such an achievement can only be attained through close co-operation and advocacy among all stakeholders. Our industry is continuing research efforts towards new therapeutic approaches for psoriasis with high efficacy and easy administration to improve compliance and reduce the long-term risk from co-morbidities. Also, most work on the epidemiology of psoriasis has been carried out in Europe and the United States. Wide-ranging international data are mostly lacking. More research collaboration internationally is needed to help to address global knowledge gaps on the disease and potential trends over time. Most people with psoriasis suffer feelings of stigmatization because of their highly visible symptoms. The stigmatization of psoriasis is higher than for many other skin diseases with sometimes severe consequences in terms of depression, disability and dismal quality of life. Children or adolescents who develop psoriasis are hit particularly hard by the psychosocial impact of the illness.